The English Farmhouse has been described as the ideal home with enough rooms for a family, from a spacious kitchen and larder to a boot room for muddy wellies. This farmhouse in Wiltshire is a good example of a perfect country house, full of charm, with flower and vegetable gardens and outbuildings, and a convenient hour’s drive from London. 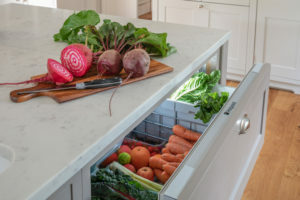 The context for this kitchen design project was a fairly major remodeling of the main room, an extension to the farmhouse in need of an update. Guild Anderson worked in tandem with architects Affinity Architecture to create something wonderful out of what was originally a rather large and austere room. Structurally, the ceiling height was lowered to create an additional bedroom above. 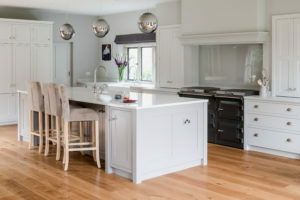 This still left tall ceilings for a substantial kitchen-dining room and with better proportions in the revised layout. 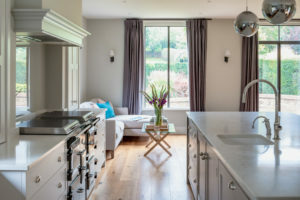 ‘For our new home, we wanted a bespoke kitchen that was easy to live in and also designed in a way to minimise the clutter that so easily builds up when the children are around,’ says Jo, the owner, summarising the design brief for her new kitchen. Jo enjoyed the collaborative approach of the kitchen design team at Guild Anderson and she explains how the project came about. Nick sees another key part of Guild Anderson’s distinctive design is, in place of blankly fitting units and appliances into the available area, to approach a kitchen design as a collection of pieces of furniture. The new kitchen is well served with appliances. Guild Anderson see part of their service is to advise clients on which appliances might best suit their lifestyle and make it their business to keep up to date with technical developments in the appliance market. Many Guild Anderson clients opt for an Everhot as one of the most efficient and flexible of the range cookers. Another key part of the design was to create a chimney-breast around the Everhot. The chimney was entirely new: Nick designed and created the studwork and cornice. It functionally hides the extraction system but also provides a focal point for the room. Where does Guild Anderson go over and above what was expected from a run of the mill kitchen design? ‘Being a small company, I felt I always had access to Nick Anderson which meant a great deal to us. Nick was personally involved throughout the planning process for our kitchen. I felt he understood us and wanted to make things right for our project,’ Jo says. Jo is very clear about one additional area where Guild Anderson’s service stood out: the Colour Consultancy paint service. It is hard to describe Guild Anderson precisely, who they are and what they do. Yes, they design, make and fit kitchens, but this is not entirely true. 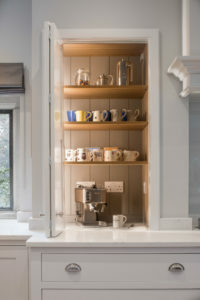 They craft spaces with furniture, make dreams a reality, and obstacles into a feature through stealth: an unwanted doorway of an old house becomes an in-frame half glazed handmade cupboard set back into the wall; an inconvenient reverse to a staircase is turned into a set of neatly stepped drawers inside the kitchen. Their attention-to-detail is second to none and the quality of their work adds value to a family home such as this.